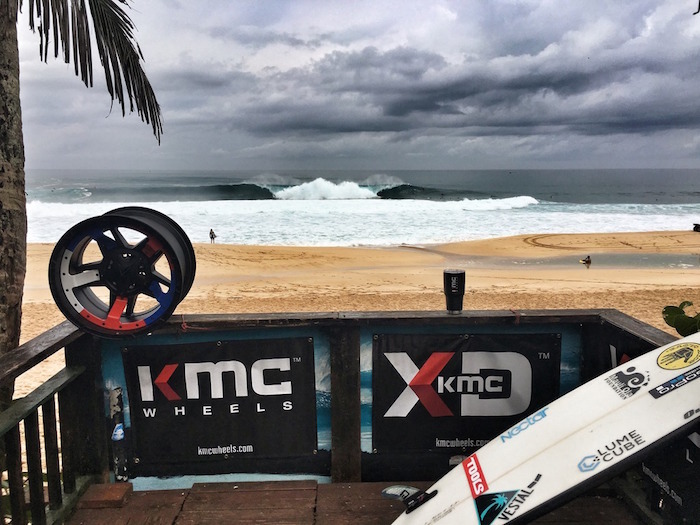 KMC WHEELS announced today that the local Hawaiian surfer that charged the hardest will be awarded with a set of XD Series wheels following the winter contest season. It is the season where the world’s best surfers join the local Hawaiians on the North Shore, and the stakes remain high with careers on the line. Local surfers in contention for the KMC XD Series wheels are being judged based on the following criteria throughout the six week contest series as described by KMC Wheels ambassador and Pipeline local Jamie O’Brien (@whoisjob) in his recent Instagram post: overall competition, free surfing, wipeouts and XXL wave selection. The KMC XD Series were built for individuals that require precise equipment for imprecise environments. The wheels remain lightweight, strong, and race tested and approved. KMC Wheels is redefining performance on and off the asphalt with innovation, style and a relentless pursuit to confront possibility. We are for the rule-breaking, game-changing individuals who defy convention in motorsports and use machines to pull off the impossible. KMC has deep roots in off-road performance, from the deserts of the Southwest to the ever-changing terrain of the Baja peninsula, this is race-proven technology now injected into the powersports market. KMC Wheels is manufactured by Wheel Pros and sold in more than 20 countries on four continents through a network of more than 25,000 authorized dealers. It is one of the world’s largest suppliers of branded custom wheels, performance tires and related accessories for cars, SUVs and light trucks. Headquartered in Denver, Colorado, Wheel Pros is a leading designer, marketer, and distributor of branded aftermarket wheels. The company also distributes performance tires and accessories. Founded in 1995 with two distribution centers, the company today carries proprietary, leading brands that are recognized across all major vehicle segments and are sold through a national footprint of 27 distribution centers and internationally.